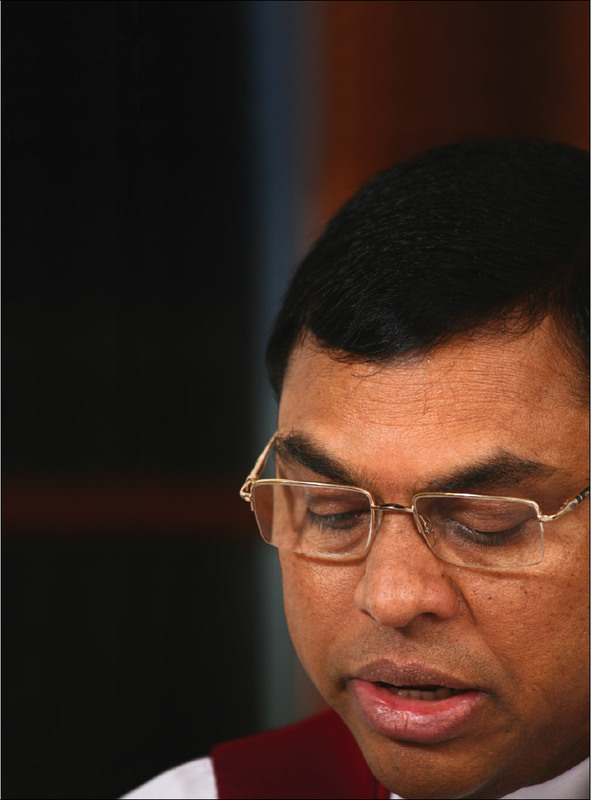 Former Economic Development Minister Basil Rajapaksa was arrested by the police today after he was questioned by the police Financial Crimes Investigations Unit. He is to be produced in the Kaduwela Magistrate Courts tonight. Two other officials, former Secretary of the Ministry Nihal Jayatilake and former Divineguma Fund Director General R.R.K. Ranawaka, who were accused of committing fraud under the ‘Divi neguma’ fund were also arrested today. Former President Mahinda Rajapaksa’s brother Basil was questioned for several hours since this morning and he was later arrested this evening. 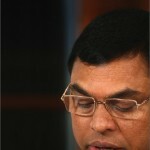 Basil Rajapaksa returned to Sri Lanka yesterday from the United States . Excellent move by the authorities. ” It is incomprehensible to see the robbed (masses) welcome the robber” . It leaves me with question where are we heading as a nation????? Lets wait for few months and see if the present government means what it says. It could turn out to be another eyewash. By the way the two officials should have put their foot down and stood up to the clan and cronies. They are responsible for every cents spent by the state under their department. is basil straight going to the prison ward ? poor thing , he might need urgent medical help ! Remanded until the 5th ! Don’t worry , this is normal , there is a segment of any society who is very vulnerable ,prepared to do any thing , that’s a hard fact of life. we will have to let go that lot , but there is a good news though , that 6.2 million majority represented us. Hope this is no media show to burst ballooning public pressure. If it is real, I have no time to waste. I want to know where these high flying criminals stashed away my tax money. In which Swiss bank and in which country. I want it back. Now. I also want the money burrowed in my name from China and other lending agencies. And in my fellow Sri Lankan citizens name too. It has taken 99 days to come this far. I welcome it. If you steal from us in the future, be careful. We will get you. This arrest has vital symbolic importance. We need to rescue spineless, idiotic Sri Lankan voters from their fantasy about this criminal, lawless, uneducated & racist clan. That will stop at nothing in their quest for power. Basil, Gota, Percy or Namal are not above the law. Period. PS: Basil arrived in a single 4WD vehicle. What happened to the convoy which used to include a brand new ambulance? This is progress. I also want to see the gigantic 4WD vehicles given to these criminals gone. People who drive huge 4WD SUVs in congested Colombo are retards. So are the state officials, including bureaucrats, policemen, members of armed forces, judicial fraternity, …..
Will the government arrest them and through them in prison as they failed to do their job. They are supposed to be the guardian of the state and its resources. Absolutely right Ben Hurling, those who drive these vehicular monsters on our roads are mentally retarded, moronic and plain godayas without an ounce of refinement in them. No matter how powerful the Rajapaksa’s were they STOLE from the country..and now its pay back time… interesting that GOATa made a statement yesterday stating that MS should invite MR as the PM. LOL… now they ALL are like cats on a tin roof with their tails up and nowhere to run..
Now MR Gota and Namal might be peeing in their pants already… did they EVER think a day would dawn where they would be arrested and be hauled to courts? I bet not…. I salute Saddam ( though I hated him as a dictator who killed people like Gota and MR)for dying with guts.. even when he was being intimidated and hung … these morons are already like crabs in a hot pot..
To the Cess Pitt and down. Will there be another slumber party protest at the Parliament building? Basil and Namal took bribe to allocate lands, in particular, in the East. Specialist investigative team must probe every piece of land handed over to companies and individuals and go further to establish the kick backs taken by them. Not true. These lands were held by their ministerial department, not in their “name”. The present government headed by UNP will release the lands back to the victims. Did you get any kick back from Basil & Co to deny that state lands were not given on long term lease? We all know these are not their private lands. If so this issue would not have been raised here. Their moto was, without money passing under the table, there will be no deals. I will further say, the police must interview those who did not get the lands on application and the truth of money laundering of the duo and their agents will easily surface out. That’s all the people of Sri Lanka ask for. Any sign “KP” the LTTE mastermind and interpol wanted criminal being arrested yet with Basil ? Will you now advise the government to arrest warmongers and war crime deniers not for what they believed but for writing garbage and inflicting mental cruelty on all of us? the 1st in line would be none other than the notorious CT contributor DJ….pretty soon he might take a break that he promised to be away for 6 months. Not really , DJ was the guest tonight at the Sirasa “Davasa ” program, i couldn’t believe what i was watching , he is completely lost ,his arguments were very, very childish ( tried to compare with Thissa A apportionment to RW appointment as PM ), as Sirasa is an anti Ranil channel , it always tries to get his views . both Sirasa and DJ need to be boycotted. KP is living in the lap of luxury in a 2 acre lot in a palatial palace type accommodation. The location is with a big board NERDO just off the A 9 (100 yards) and 3 minutes drive from the Railway Station and Kacheri. Good Governance is a big Joke and he is guarded by the Gajaba Unit. Even the Minister of Defense or his deputy Ruwan Wijewardene cannot enter the premises. The Chencholai orphanage he runs next door is another can of worms which I will leave it for my BOOK. lol. You fellows should call for KP’s arrest everyday without having Katte Pittu and being scared for 100 days. President Sirisena should give an answer in his speech tonight at 9 PM about the BAD GOVERNANCE and call for General Elections immediately. The current GOSL has no mandate with UNP having only 49 MP’s to rule, and Sirisena lost even the Bandaranayake stronghold Attanagalla and Anuradhapura, because Tiss Attanayake campaigned against Sirisena. lol. KP is having conjugal visits regularly from his wife and daughter in Thailand where as Hundreds of Tamils are tortured and held in Boosa, Welikada, Magazine prison and secret torture chambers for years. Even Lasantha’s murderers -The 8 army guys are living a luxurious lives and Ranil who is Lasantha’s friend has no idea about this nor the whereabouts of them. Poor Lasantha. I am not a sceptic; This looks too good to be true.To-morrow the 100 days come to an end! So did Basil walk in to get himself arrested! Like in Alice in Wonderland this is getting curioser and curioser! The amounts missing is substantial a nd unbailable. Both the President Maithreepala Sirisena and Prime Minister Ranil Wickremasinghe are decent gentlemen with high human values. They know the culprits have to be punished but they did not rsort to the jungle laws practised by the previous regime. They presumably have given the freedom to the CID and all other agencies to do the right thing. Naturally, there has been delay which is inevitable when you are compelled to do the right way and now you can see all falling in place. It can be envisaged others in the family are due to follow and may a day will come when they can establish their ” mahagedera” in the new locatiin of their residence. Good Luck to all of them..
are there any corruption charges against foul mouth Bandula G ? where are our notorious Laxman Hulugalla , Nimal Perera (not the Billionaire), SB Dissanayake’s university lackeys , PB Jayasundara , Ajith Cabral , Godahewa , Dilith Jayaweera et al ? are they exempted ? CID ≠ FCID. Basil was arrested by FCID (Police Finance Crime Investigation Division) which is a subsidiary of Police Department. Not Criminal Investigation Department. FCID was formed by Hon. Ranil Wickremesinghe, He vowed to respond to high-profile crimes committed during last regime. CID existed when the country achieved the independence more than 68 years ago. CID’s responds to crimes are SLOWER than FCID. The FCID have an experienced financial crime analyst and investigator, not just a policeman. I guess you should not mix both divisions since CID doesn’t have the capabilities what the FCID has. as the sling started tightning Basil came to Sr Lanka…. it was not necessary for him as he could have stayed in his domicile in LA without having any need to answer the SL authorities. this itself is fishy. why did he come at all? to get questioned? get harassed? get arrested? There is a plan behind this motion. And Gota is making statements regarding power sharing with MS, WW, Namal and other clowns staging a protest in the Parliament itself, and so on. May be the MR and the gang is planning a coup. I am almost willing to believe that there will be a mass protest and unrest due to the arrest of basil will be staged by WW et. al. Then there will be an emergency situation to be solved. It is going to be zero line to deal with MR and they will make demands to ask their supporters to Let us wait for 48 hours and see what happens. Onething is clear, we dont need LTTE in Sri Lanka to have an unstable state, the majority will do it for themselves. And for this we have been suffering for the last 30 years or so. What about others who stashed away money in accounts. Chairman state mortgage bank had taken money to the Battaramulla commercial bank and deposited. A previous CT report indicated with copies of receipts for 10,000 given to returning officers by an mara government servant with name and tel no…. All this was Divineguma money. Get statements from them too. Hi, fellows, don’t be in a hurry. You all know very well as much I do that the Truth takes time to come out. Because liars are very much calculative, so what they do first is to hide the traces, before they go to rob & especially in the modern days all high technologies are more used by criminals than the honest and sincere workers. It is only the Law that will be in favour of the truth. Also the silent majority are peace loving and not violent. See, out of the 225 member Parliament this 23% or 50 odd criminals and hooligans who robed the nation along with the MARAS are making havoc. But the time will answer. If the present Government wanted, it could have put all the criminals for occupying the Prliament at night for atrocities. in prison. It didn’t take the law in to its hands in a hurrying Mannar. Because let the idiots who still believing the Natioal Criminals of MOTHER SRILANKA to come to know what is Justice and GOOD GOVERNANCE. See how the UN is delaying in releasing its reort since 2012. There are also a greater proportion of SriLankans who believe in slow and steady process rather than in an accelerated style which is definitely good for the country in the long run. Let’s not get impressed by this move until this arrest is followed by the legal proceedings, and justice if deserved, be served. This may be a token arrest to impress the country, and he may get off later. The Rajapaksa’s have to be investigated and if found guilty of the corruption, and even the suspected murders, they have to face a court of law, like all citizens, and pay for their crimes. Reading the press coverage,one would have thought a rock star arrived in the country. What on earth is it with the print/electronic media? This is a man who has robbed,does robbery make one a star for the media? Cannot wait to see the whole Rajapaksa family in jail. The government should take all the stolen money back. Where are these wonderful folks? KA Sumanasekeram, David Blacker, Sach, Siva Sankaran Sarma, Fathima Fuckushima, etc? Instead of them now you have Taraki, Jazz, Madhavi, ………..
Great move Mr. Ranil Wicramasinghe. These [Edited out] who killed our Sun God needs harsh punishment. Don’t stop with this guy. Get all the Rajapakses especially Mahinda and Gota. Get Fonseka also. Get all those armed forces top brass to the gallows. You owe it to us. We have started celebrating already. The government will be creating martyrs unless conviction and prison follow. The venal Rajapakses will strain every sinew in their system to create maximum trouble on this move- which they will consider “provocative” Remanding Mr.10-50% – they know, is the step before Gota and MR are taken in next. The swords are out and the battle line drawn up. Ranil will be the first to abandon, if trouble breaks out. The Sirisena team has to plan out their counter-attack immediately. first is to get the Mahanayakas, the Buddhist clergy and the armed forces on to their side. The Rajapakses have already taken over the Parliament. What shameful and unprecedented behaviour in Parliament. There is no respect for the sacrosanct dress code or Parliament itself. Sri Lanka’s biggest handicap is the lack of discipline – in every field of activity. It is discipline that brought Germany, Japan and the Western powers up. We simply don’t have it in us – with out thug mentality. Rajapakses fear CBK the most. They’d love to get rid of her. The hooting incident was the first. They know she has the clout – locally and overseas – and therefore she will be in the top of their elimination list. But the come-back girl knows how to hit back. This is Karma. It cannot be easily forgotten when these Rajapakses & their cronies humiliated and threatened the former Chief Justice Dr.(Mrs) Shirani Banadaranayake and enforcing an illegal impeachment. It will be better if all those in the PSC are trapped. Even Rauff Hakim was criticizing her by joining hands with Rajapakses. When will he get caught? Justice should be manifestly seem to be done. That is Dharmista. SANCHEY and many others question why did Basil Hora returned to Sri Lanka despite the Senior Hora MR advised him not to come to their most loved mother land SriLanka. MR disclosed this story at the Matale recently.